The spring semester at Franklin, especially post-Academic Travel, is always incredibly busy. The change in seasons brings people outside to celebrate a variety of events. In particular, each April Franklin holds University Day, during which classes are cancelled and students are encouraged to attend events all day that celebrate Franklin, its students and their accomplishments. 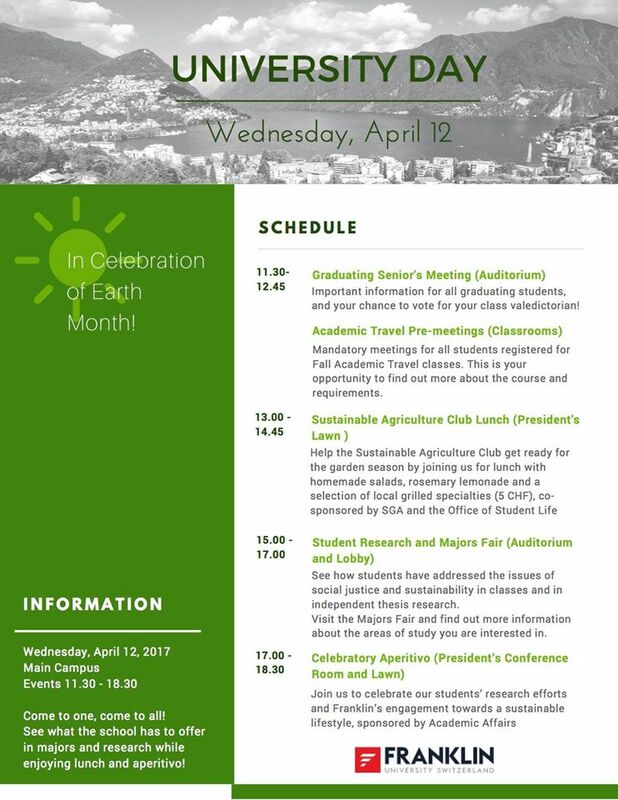 This year, University Day was sustainability-themed, in honor of Earth Month. Franklin's Sustainable Agriculture Club put together an incredible picnic lunch that was held on the President's Lawn at Kaletsch Campus. 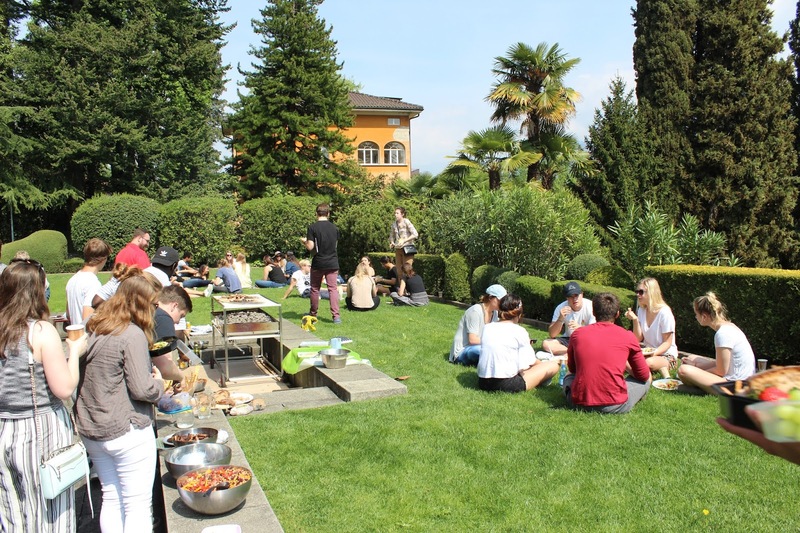 The food was prepared from local ingredients (some coming from our campus garden) by students involved in the club. Foods prepared by the Sustainable Agriculture Club included salads, local meats, and delicious deserts. N., Len, and Carly - some of the club members who helped make this event happen. Next, students attended research presentations held by their peers. 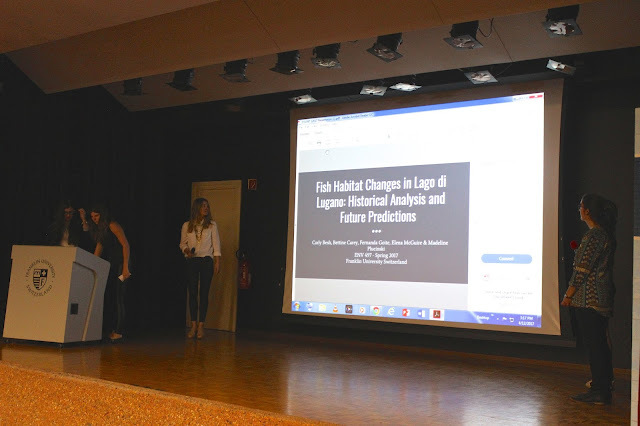 One group has been studying Lake Lugano's climatic data from the past 30 years in regards to fish habitats, whereas another group spoke about sustainable development. 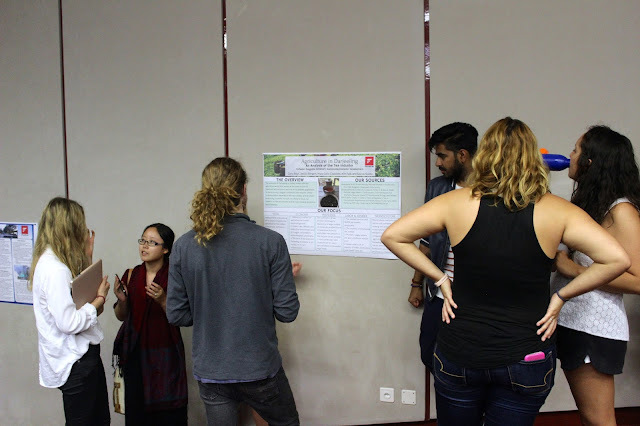 Students presented projects they have been working on this semester. 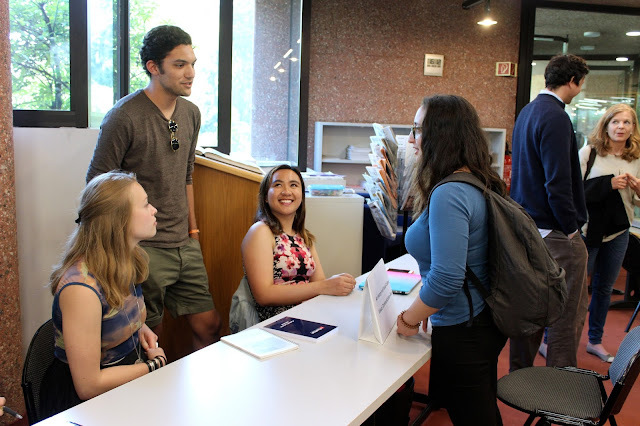 After that, students were invited to the Majors Fair, where representatives from each area of study at Franklin were available for any questions from underclassmen. 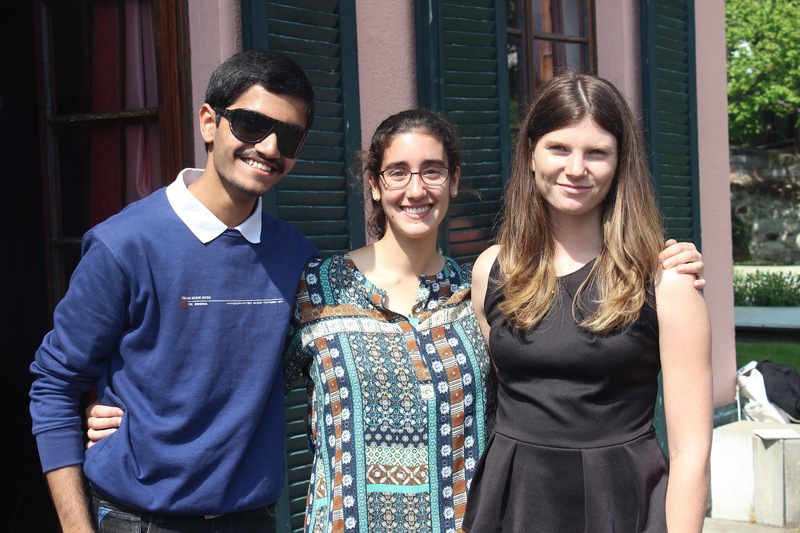 Students were even able to officially declare their majors or minors at the event. Students were able to ask representatives questions about different areas of study. Representing my major! 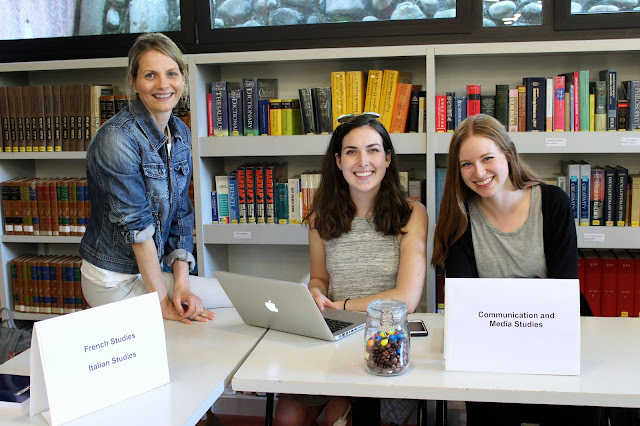 From left to right: Professor Vogelaar (the Communication and Media Studies Department Chair), Madeline (who runs much of our social media at Franklin), and me. The last major event of the day was an aperitivo to celebrate students' hard work. Luckily for us, it was a beautiful day! 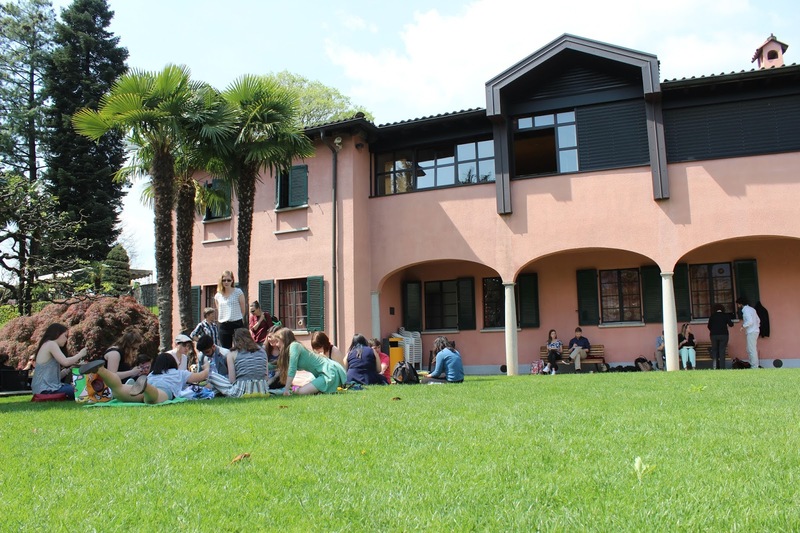 Students mingled inside and out on the lawn thanks to the lovely weather. Perfect weather for spending time on the President's Lawn. So what's next? Besides a packed schedule of interesting lectures, film screenings, club events and the like, coming soon is Holi! If you aren't familiar with Holi, it's a Hindu spring festival that brings people together. At Franklin, it's an annual festival where we celebrate the cultural diversity among our student body. If you would like to stay updated about what's happening at Franklin, be sure to follow us on Facebook and Instagram!